President Cheryl Brickey called the meeting to order shortly after 1pm and welcomed everyone. Eleven members and one visitor were in attendance. Leslie White, proud new owner of the Bernina Sewing Center and GMQG member, stopped by to invite us to the new location at 2310-A East North St., Greenville, SC 29609. The class room, 2½ times larger and equipped with large pressing tables, is available for open sewing with friends when classes are not scheduled. We need to call ahead for availability. When we out grew the previous location, we started meeting at the Taylors library. Our June meeting will be held at the Bernina Sewing Center. Landrum Quilters’ biennial quilt show will held June 11, 12 and 13, 2015 at the Landrum Middle School. There will be over 140 quilts on display and three special exhibits. More information can be found on their website under the 2015 Quilt Show tab at www.landrumquilters.com/about.html. 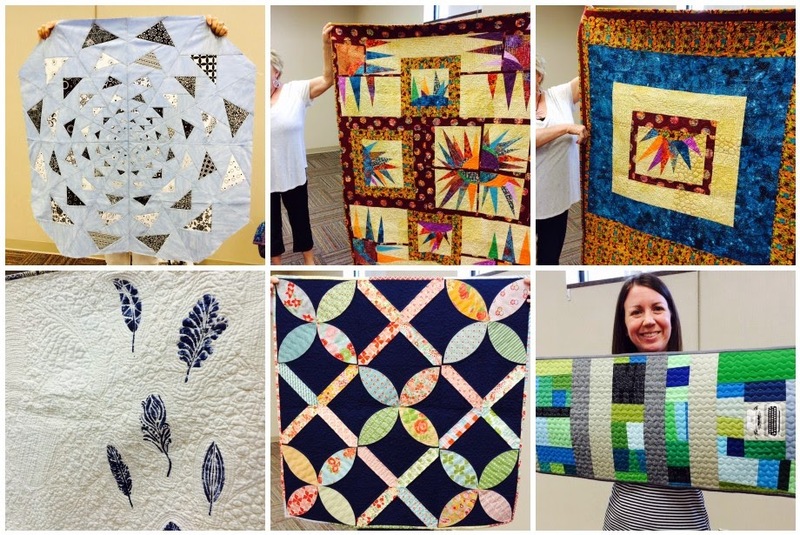 June’s meeting will be one week later (on the 20th) due to the Landrum Quilt Show. Riley Blake Fabric Challenge – the fabric for the 2015 Modern Quilt Guild challenge is The Cottage Garden by Amanda Herring (The Quilted Fish). The deadline is at the end of July. We will present our finished projects at the August meeting. Details are in the April Meeting Recap post. Mystery Quilt – In June, Cheryl will be starting a Midnight Mystery Quilt-A-long which will run through March 2016. We are invited to join in the fun. A Lap size quilt will be auctioned at a silent auction at a December 2nd fundraiser for the Meyer Center. The goal is to have all of the blocks for the quilt complete by August and to arrange the blocks into a quilt top design at the August meeting. Darleen volunteered to piece the blocks into a quilt top and supply the batting. Fannie has volunteered to do the quilting and Cheryl volunteered to bind the quilt. Several star blocks were collected and will be added to the other blocks to be incorporated into the philanthropy quilt. June’s block of the month is Pinwheel #8 by Marcia Hohn of the Quilters Cache. Continue to use fabrics in blues and greens. Oven mitts were made by Cheryl, Lucy and Nancy and were swapped by passing them to the right. Treasurer Paige Alexander collected dues from 11 members. 2 others previously paid bringing the total paid membership to 13. Required paperwork will be submitted after the June meeting for us to join as an official chapter of the Modern Quilt Guild. 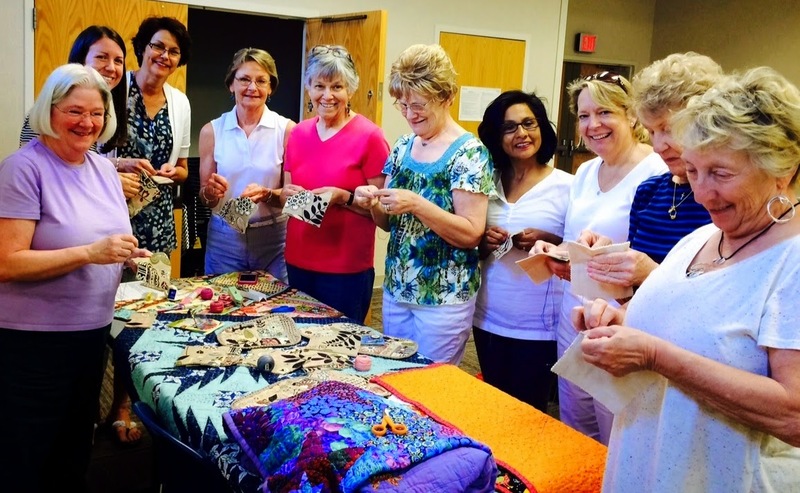 Vice President Debby West gave an information hands-on program about big stitch hand quilting. Her handout included a list of needed supplies and favorite books by SarahFielke. Debby provided needles, thread and fabric sandwiches for us to give big stitch hand quilting a try showing us tips on stitch length, starts and stops and burying knots.